Chantix is the newest stop smoking pills that help a smoker to quit. It is FDA approved. Chantix is designed specifically to target nicotine receptors in the brain and block nicotine from attaching to your brain by binding to the receptors themselves. When looking to quit, relax, you are not alone. Identifying the best possible smoking aids can often become daunting and overwhelming. The majority of smoking aids, readily available online will often turn out to be false promises, thus leaving their competitors tarred with the same proverbial brush. At any point in time, 70% of smokers attempt to end their nicotine addictions. In addition to nicotine replacement therapies (NRTs) and other stop smoking products, there are two prescription drugs that have been approved for smoking cessation treatment, Zyban and Chantix (varenicline). 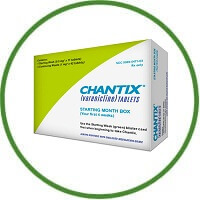 Chantix is an FDA approved medication developed by Pfizer. It helps a person quit smoking by reducing cigarette cravings and inhibiting the pleasure received from smoking. Unlike other stop smoking products, Chantix does not contain nicotine. Instead, the drug acts on the brain in a couple of different ways to help people stop smoking. First, it competes with nicotine to attach to the nicotine receptors in the brain. This reduces nicotine cravings. Second, it also reduces the amount of dopamine released in the body, which decreases the feelings of pleasure felt after smoking. Chantix is effective at helping people quit smoking. Pfizer reports approximately 44% of people in a recent clinical trial quit smoking within 9 to 12 weeks of starting the medication. The average person in the trial smoked for 24 years and went through 10 cigarettes per day. A 2006 trial found that 23% participants maintained their nonsmoking status for a year, and a 2009 trial found Chantix was more effective than nicotine replacement therapies and bupriprion. However, Chantix is only effective at achieving short-term results and is only approved for up to 24 weeks of use. Studies found that over the long term Chantix was as effective at maintaining smoking cessation as nicotine patches. Although this medication has the potential to help you quit smoking, it can cause some serious side effects to develop. In particular, Chantix must carry the FDA’s black box warning because using it can lead to depression, suicide ideation, and suicidal behaviour. It is important to seek immediate medical attention if you experience sudden behavioural changes, feelings of aggression or hostility, suicidal thoughts, depressed mood or moods atypical to you, paranoia, hallucinations, or confusion. If strictly comparing Chantix to a placebo (sugar pill) and Zyban (another nicotine-free replacement), it does show a better success rate, but out in the community, it seems to work 23% of the time if used by a select group of smokers. Older than 18 and less than 70. Have been smoking more than 10 cigarettes a day. Weigh more than 45kg and have a “body mass index” (weight in kilograms / height in meters squared) between 15 and 38. (If you are 5’7” you cannot weigh above 242lb). No heart problems or blood pressure more than 150/95. No major depression or a panic disorder. Have not used Zyban or another NRT and failed before. However, Laser (2000) estimated that persons diagnosed as having a mental disorder within the past month consumed 44% of all cigarettes smoked in the United States. Therefore, the extensive psychiatric exclusion criteria make it difficult to apply their results to the general population of smokers. The company recommends starting 1 week prior to your quit smoking date. 1 course lasts for 12 weeks, where the dose is increased over the first few days. Chantix is taken 2 times a day which is exceedingly easier than chewing gum, and it doesn’t have a visual component that makes you stand out in public. Taking a stop smoking pill like this does cut out the harmful side-effects of cigarette smoke and would be a better choice even if there was a dependency transfer. Chantix is not recommended by the FDA as a first-line treatment for smoking cessation. The medication is more for people who have failed to quit smoking previously using different methods. If this describes you, then it may be worth talking to your healthcare provider about using Chantix to help you quit smoking. However, there are more natural methods of quitting smoking that don’t cause unpleasant or harmful side effects to develop. Read our reviews on the homepage for information about an easy way to quit smoking quickly and safely.